I was given a ".las" data set from a Trimble/AutoCAD shop. I use Esri. I could not import the .las file they supplied to an ESRI LASDataset as it was created with Trimble software. I downloaded and used LAStools to convert the Trimble las file to a .txt file parsing "x y z i c r n" columns into the file so i could see what the data set looked like. The coordinates (x y z) are all good, and the intensities (i) look normal, but all of the other data (c r n) is 1's. Everything is a 1. Can I run classification commands on this data to get ground (bare earth) if all the returns data is 1? I cannot perform the LAStools "lasground" function yet because I do not have the license to do so and I do not yet have the approval to obtain such a license form my IT guy. I can go that route eventually. 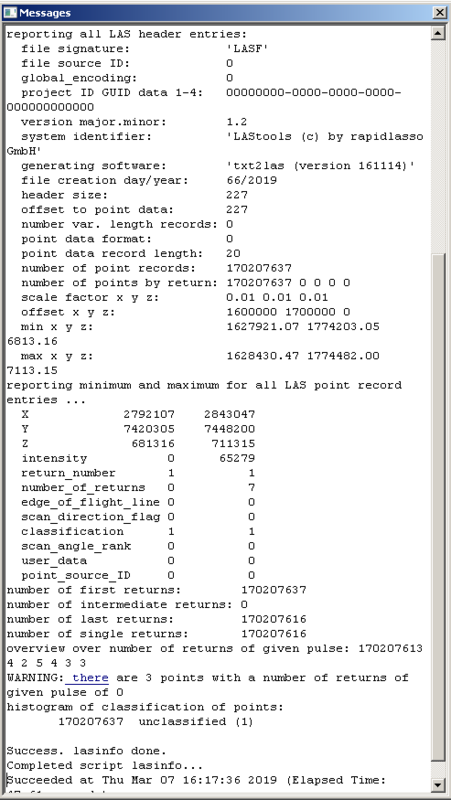 I just have little experience classifying las data and I want to know, given the above format, will LAStools be able to classify my data into "ground", "noise", etc...? likely not as this is first-return data only. It only contains the first return only. Note it has no intensity values either. The nice header tells me this data has been created from a text file and converted into las. Not the answer you're looking for? Browse other questions tagged classification las or ask your own question. When to reproject LAS data? Can LAS files be downgraded? Assigning class codes for LAS files?